Deep the depths of my heart, I still pursue this dream of flying real high. Somewhere from where all is visible… all is clear. I want to take that journey that will fill my lungs with the fresh breeze… the cool air. This piece is designed looking at those objects of nature which hold this privilege to fly… to experience. 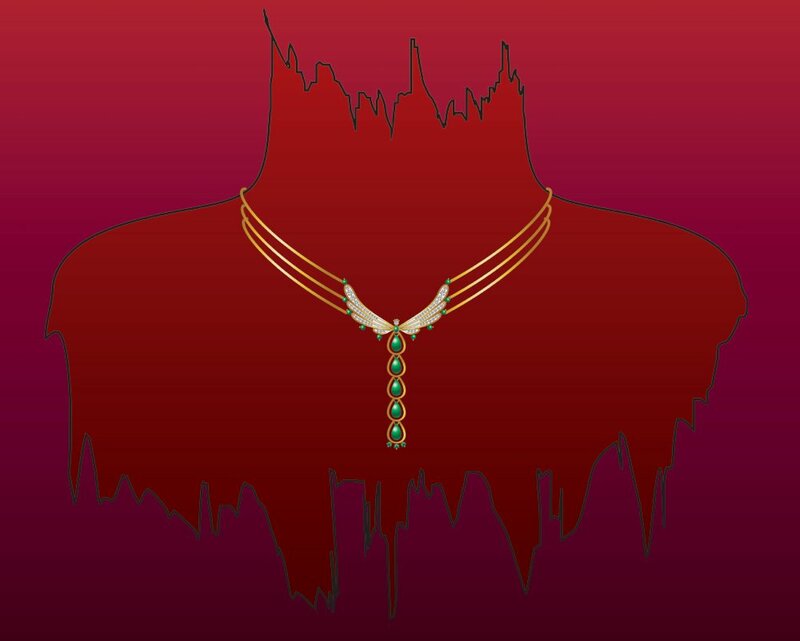 My passion to design jewelry and this dream of flight are both reflected in this design where I have embedded diamonds and Tsavorite garnets in 18K gold. This design is completely molded in 18K Gold. I have used yellow gold as the base for the entire product with highlights of white rhodium polish on the prongs holding the diamonds. Fairly good quality of round brilliant diamonds is used to complete the glittering motion in this design. The lush green of Tsavorite garnet compliments the trail. The three chains are separated using spacers designed in effect for this piece. The movement created in the “tail” of the necklace is basically by using vertical linking from behind the metal. The Tsavorite Garnets are set after assembling the gold components in this design. The Garnets are pierced and set very simply in place on Gold wire. The chains used are round snake chains which are separated at 4 places using simple 4 hold separators. The rigidness of the chains ensure them to remain in place and shape and yet they are flexible enough to take form around the neck. This design can be easily cast into other metals such as white gold, platinum or silver. The color of the metal may it be yellow or gold will either ways not change much to the final look of the design. By using white colored metal, the color of Tsavorite garnet which is not completely “set” but is dangling in the middle of the metal does not get dampened at all. White in this case would help make the diamonds look richer in this design. The reason why I chose to use yellow gold in this case though was basically to emphasize on the Tsavorite. By using too much white, the diamonds would gain undue attention thus killing the purpose of using Tsavorite.